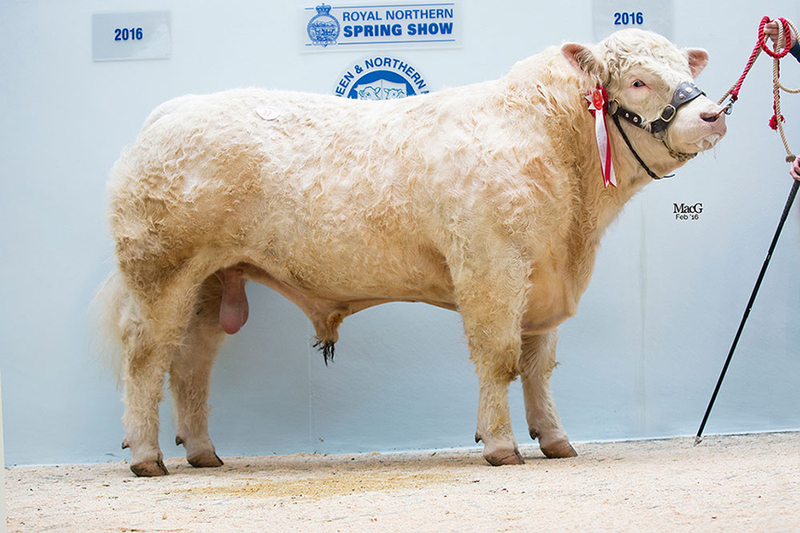 Charolais topped the bull sales at the Royal Northern Agricultural Society Spring Show on Wednesday 1 March 2017. Where 21 Charolais bulls sold to a top price of 8,000gns and averaged £4,170 with a clearance rate of 84% – a massive increase on last year’s 60%. 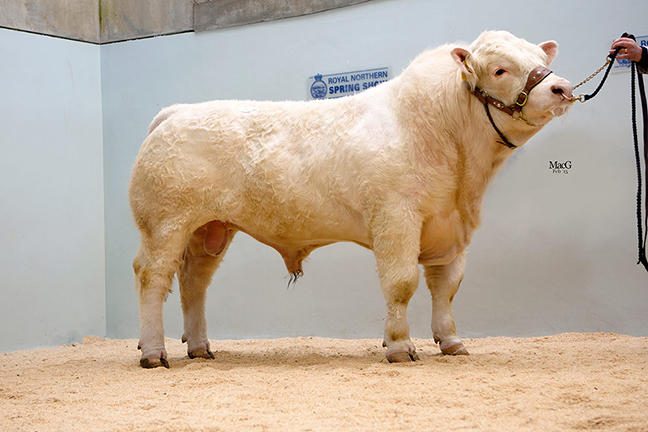 Topping the Charolais lots at 8,000gns and securing the top price of the day across all breeds, was the reserve breed champion and March 2015-born Kinclune Laurent. 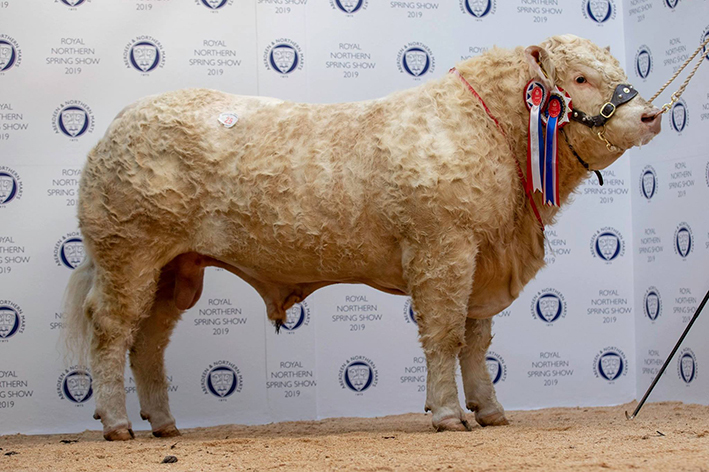 D Blair and Son, Balmerino, Fife, liked the look of this son of the 20,000gns Carlisle supreme champion Beechtree George who has sold sons here before to 8,500gns for breeders John Wilson and Sons, Kinclune, Alford, and who in turn is sired by the Royal Show male champion Gretnahouse Archangel. The Wilson’s, who sold a total of six to average £4217.50 had another Beechtree George son in the money, this time out of a home-bred 20,000gns Perth supreme champion Thrunton Crownprince daughter. Kinclune Legend, a 21-month-old who had been tapped out first in his class earlier in the day, attracted a 4,200gns bid from Messrs Steel, Banchory, Aberdeenshire. 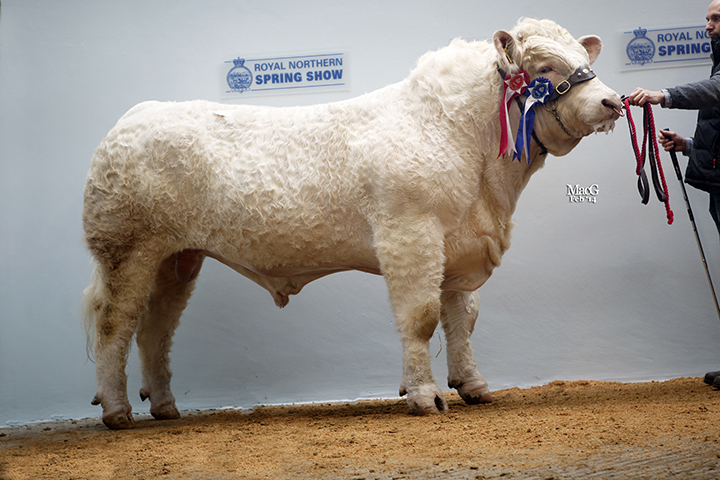 Two bulls were knocked down at 6,000gns a piece with the first being the red-ticket winner and June 2015-born Doon Lancelot consigned by Neil Barclay, Insch, Aberdeenshire. 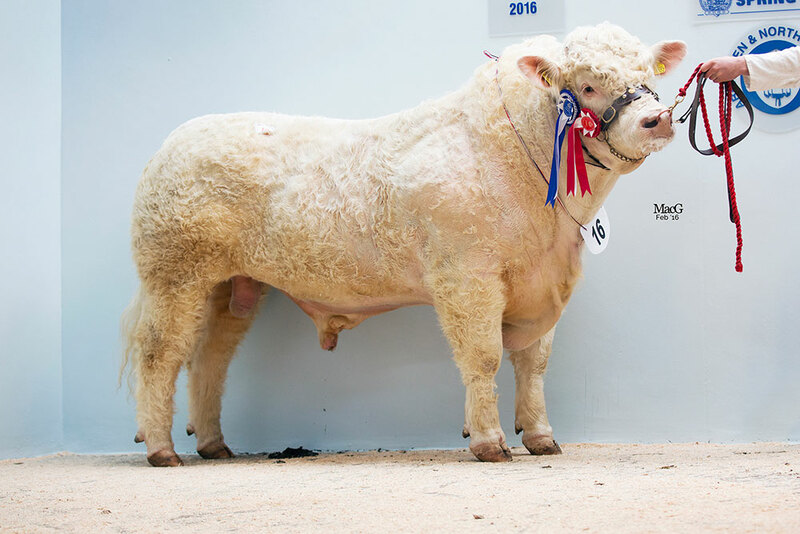 The 16,000gns Royal Welsh Show reserve male champion Anside Foreman is the sire of this Irish-born lad who caught the eye of E Innes and Son, Glenlivet, Ballindalloch. With another two bulls going on to new owners the Harestone herd averaged £4,655 for the trio. 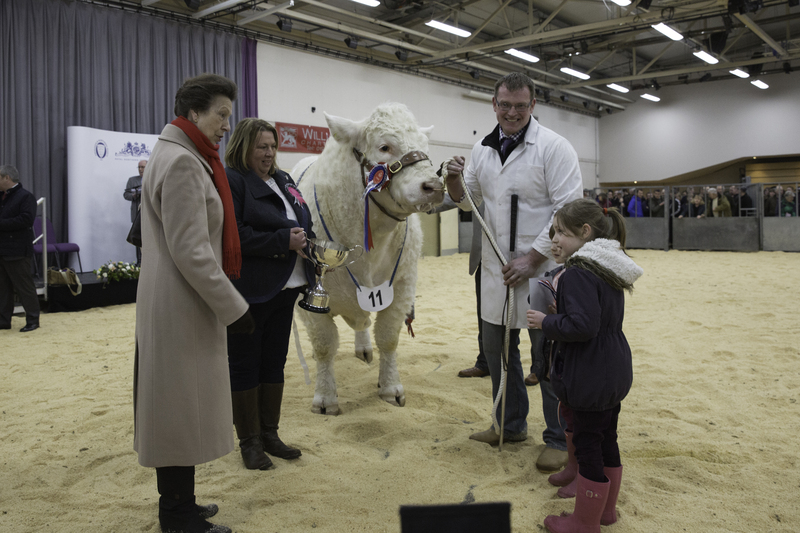 The second call of 6,000gns was paid by DM McCallum, Dingwall, Ross-shire, for the 18-month-old Lettoch Logan. Logan is the first son to sell by herd-sire Killadeas Dwane and is out of Ugie Giselda who goes back to the 14,000gns Goldies Banker for breeders and exhibitors Colin Stuart, Braes of Glenlivet, Banffshire. 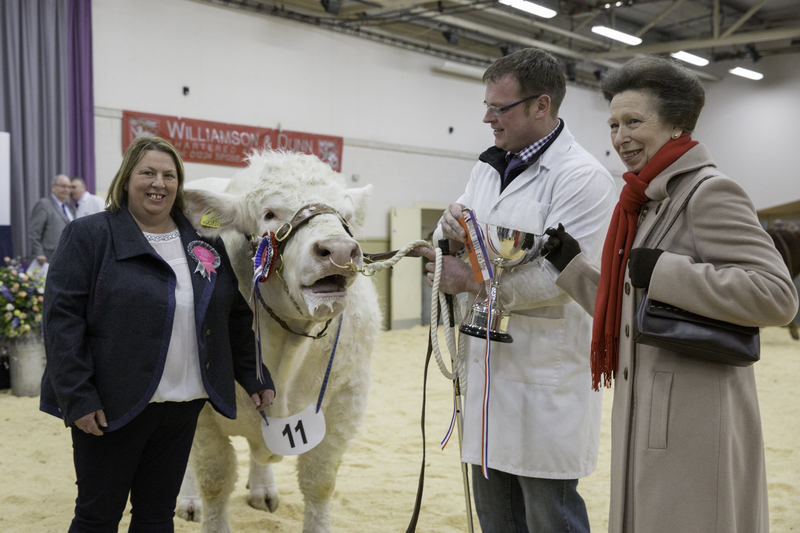 The Interbreed and Charolais champion was the next to sell for Kevin Mallarkey, Ellon, Aberdeenshire, who earlier in the day had been honoured to receive their award in a presentation by HRH The Princess Royal. 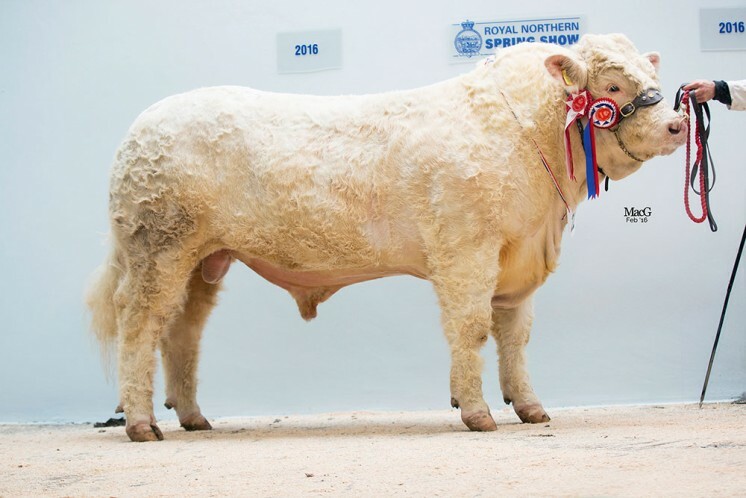 Champion Strathys Lionheart is a 22-month-old first of son of herd-sire Maerdy Harrypotter while the dam is the 30,000gns Maerdy Andes-sired Airdlin Fuzz. 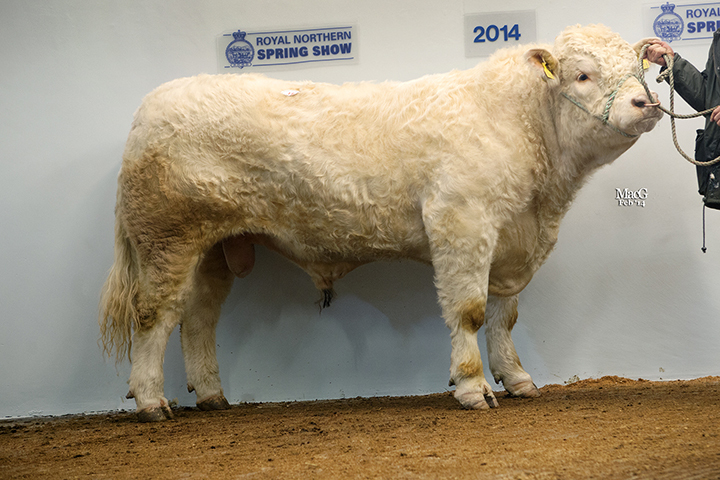 E and J Mackie were the last bidders standing and paid 5,500gns to take him home to Fyvie, Turriff. Two bulls then achieved 4,500gns apiece with the first finding a new home with C Addison and C Chapelpark, Ellon, Aberdeenshire. The June-2015-born Bonnykelly Landlord who stood second in his class at the pre-sale show and whose full brother sold at the same time last year for 5,000gns for Graeme Leggat, New Pitsligo, Fraserburgh, is sired by the 9,000gns New Deer Show Champion Newhouse Challanger and is out of the 10,000gns Maerdy Rumbull daughter Bonnykelly Erin. 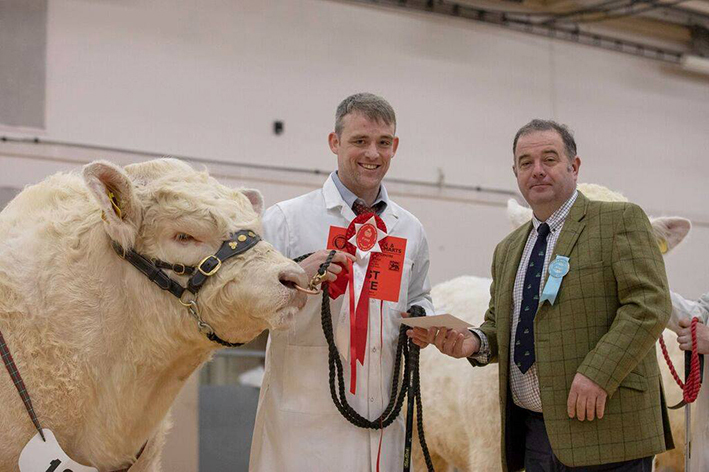 Local breeder and first time Charolais seller Neil Wattie, Alford, Aberdeenshire, matched the 4,500gns price tag with Tonley Lavezzie, who has been shown successfully previously attaining reserve breed champion at the Banchory Show and first prizes at the Turriff and Keith shows. 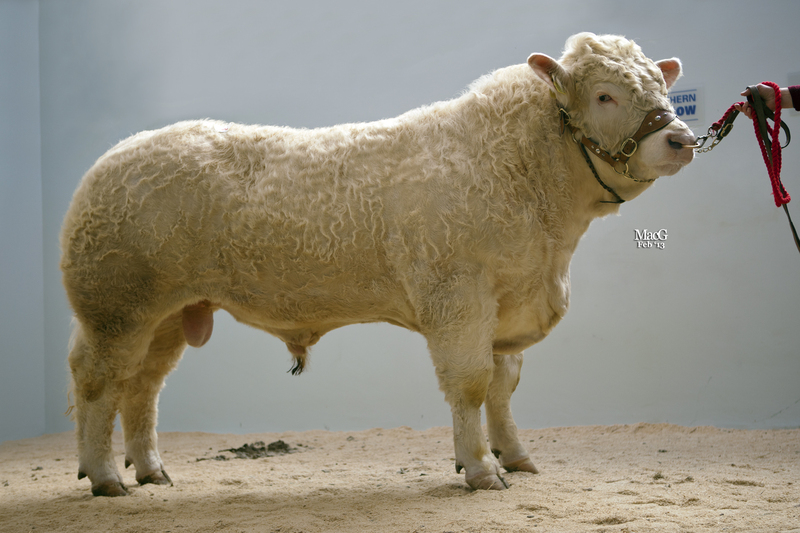 The outfit behind the money on this 12,000gns Caylers Hustler son, who at 16-months-old was the youngest Charolais of the sale were TE and M Walker, Banff, Aberdeenshire. 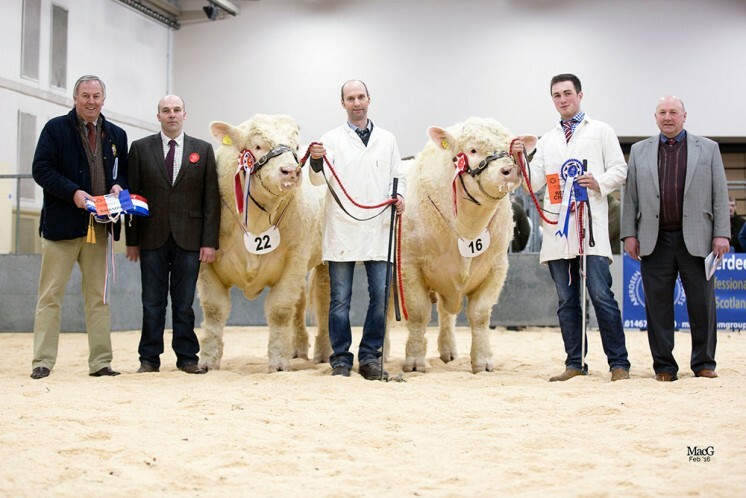 Charolais took the top price, made the highest average and sold the most bulls at the Aberdeen and Northern Marts Thainstone Spectacular on Wednesday 24th February 2016. Prices peaked at 6,500gns for the 16 month old red ticket winner Bonnykelly Jackpot, sired by Kersknowe Clansman and out of a homebred dam going back to Haymount Ulysses. He caught the eye of P and M Watson, Darnford, Duris, Kincardineshire and was bred and exhibited by Graeme Leggat, New Pitsligo, Aberdeenshire. Mr Leggat’s success came off the back of another top priced sale earlier on in the day in the form of Bonnykelly Jaguar. G and K Beverly purchased this 21 month old son of the 9,000gns New Deer show champion Newhouse Challanger for 5,000gns. The most bids of the day went the way of the Aberdeenshire breeders John Wilson and sons who sold a cracking string of eight bulls averaging £4843 backed up by top prices of 6,000gns and 5,800gns. 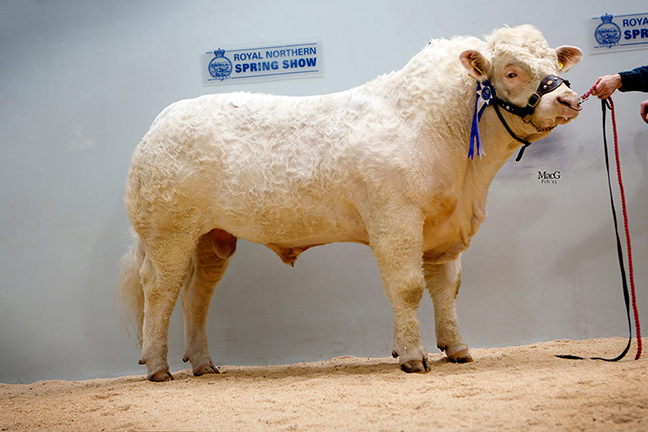 Six of the eight were sired by the 20,000gns Carlisle supreme champion Beechtree George and their grandsire Gretnahouse Archangel was the Royal show senior male champion. The top priced bull at 6,000gns was the May 2014-born Kinclune Jackass who stayed local when he was snapped up by G Wilson and Sons of Fichlie. Close behind at 5,800gns and purchased by H and AG Laing, Lochhills, Morayshire was the 22 month old Kinclune Jackpot. Next from the same vendor was another 22 month old, Kinclune Jagger who this time went home to Banchory, Kincardineshire with Kincraigie Farms for 5,200gns. TE and M Walker, Banff, Aberdeenshire were next to purchase one of the Wilson’s lots. 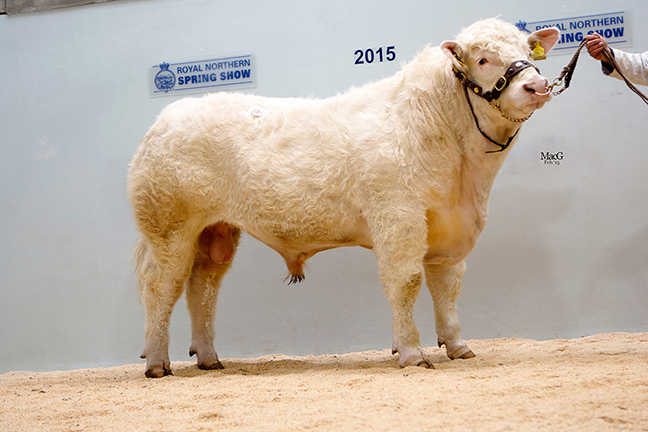 The May 2014-born Kinclune Joker was knocked down at 5,000gns. Two more Beechtree George sons were sold by the Wilson’s at 3,800gns and 3,600gns respectively. 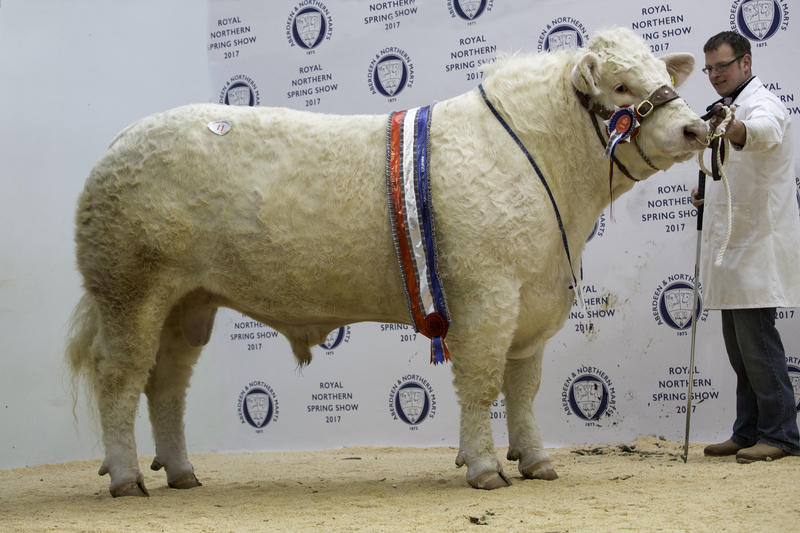 The April 2014-born Kinclune Jollyman was purchased by M and I Steel, Banchory, Kincardineshire and JS Youngson, Cullerlie, Aberdeenshire took home the 19 month old Kinclune Jensen. Mr Wilson sold his last pair, both 21 months old and this time sired by the 20,000gns Perth supreme champion Thrunton Crownprince. 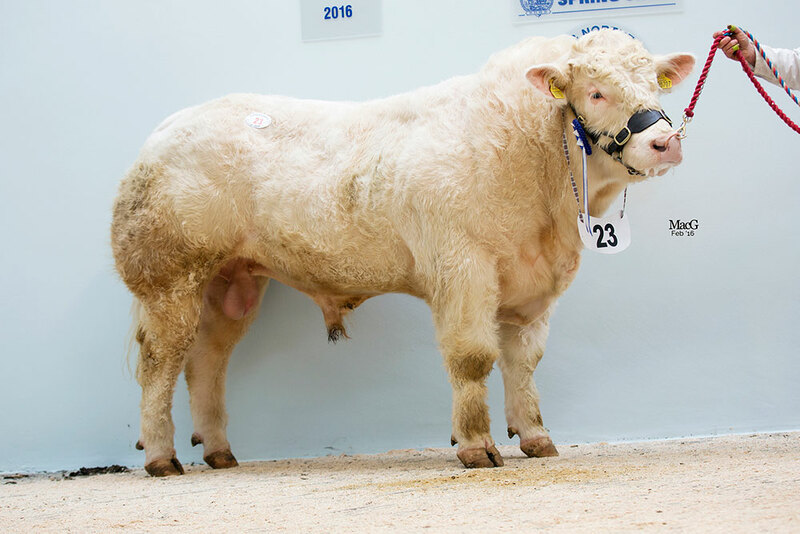 Kinclune Jake was the first at 4,000gns who caught the eye of Peter Ferries, Lumphanan, Kincardineshire and JD Oliphant, Keiss, Caithness, purchased Kinclune Jericho at 3,500gns. 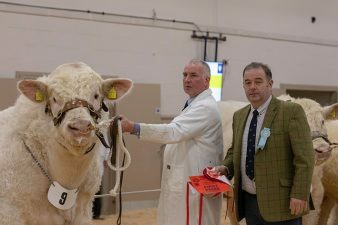 Auchnagatt breeder Michael Massie, also came up with the goods securing both the breed and Interbreed championships with his 21 month old Elrick Justice. Sired by the 16,000gns Stirling supreme champion Thrunton Fearless and out of the homebred Elrick Gertrude going back to the 11,000gns Maerdy Dublin. The man behind the money on this one at 5,000gns was JJ Gordon, Wellheads, Huntly, Aberdeenshire. Mr Massie continued his winning streak with Elrick Jagger who was crowned reserve champion. This time selling to H and J Riach, Crathes, Kincardineshire who paid 4,800gns for this April 2014-born bull also sired by Fearless. 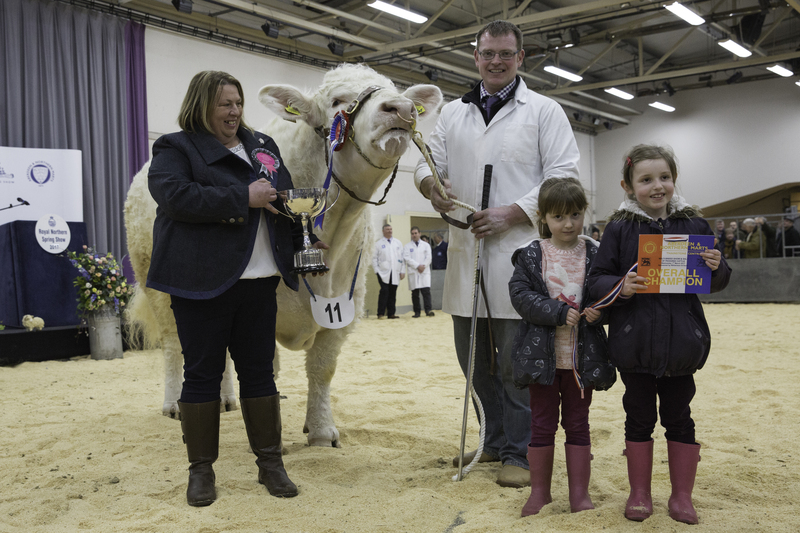 Making 4,000gns was the March 2014-born class winner Auchincrieve Jelavic, a son of Alwent Goldbar and Auchincrieve Genevieve whose 2015 born calf was crowned Junior Champion of the Stars of the Future Show. Jelavic went home to Castletown, Caithness with AA Younger and was bred and exhibited by Charles McCombie, Huntly, Aberdeenshire. Finally another of Mr McCombies’s lots sold for 3,500gns. C and C Adam, Alford, Aberdeenshire bought the 21 month old Auchincrieve Jayzee who was also sired by Alwent Goldbar. 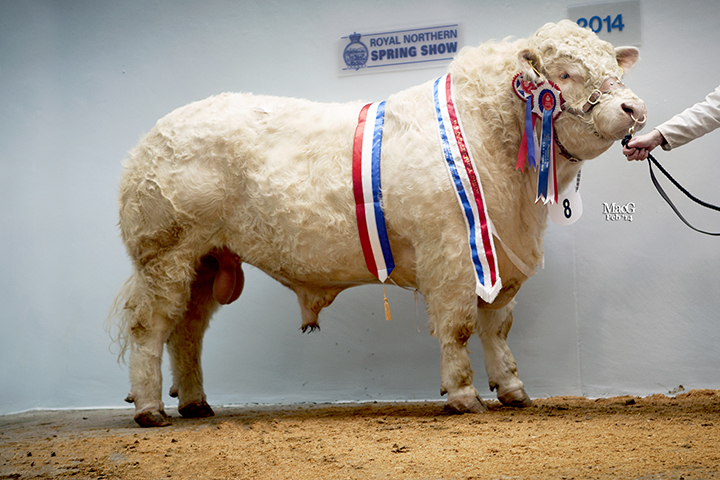 Charolais Bulls sold like hot cakes at the Royal Northern Agricultural Society Spring Show held at the Thainstone centre on the 25th February, with 15 of 16 Charolais bulls forward selling to an average of £5,873. Topping the multi breed sale at 9,200gns was the reserve supreme champion Blelack Immortal TI+58 SRI +63. This 22 month old 10,000gns Balmyle Dingle son from Neil and Graeme Massie, Logie Coldstone, Aberdeenshire was sold to W and M Leith, Keith, Banffshire. The largest consignment at the sale was from John Wilson and sons, Glenkindie, Aberdeenshire who sold five bulls all sired by the 20,000gns Carlisle supreme champion Beechtree George to an average of £6,468, four of which sold for 5,000gns and above. The first going to Messrs J J Gordon, Huntly, Aberdeenshire for 8,500gns was the 20 month old Kinclune Ideal. At the same age Kinclune Ivanhoe sold for 7,200gns to RG Mainland, Rousay, Orkney. Next came two more 20 month olds; Kinclune Ivan who went to M and I Steel, Banchory, Aberdeenshire for 6,500gns and Kinclune Idol who was purchased for 5,000gns by D Henderson and Son, Wick, Caithness. 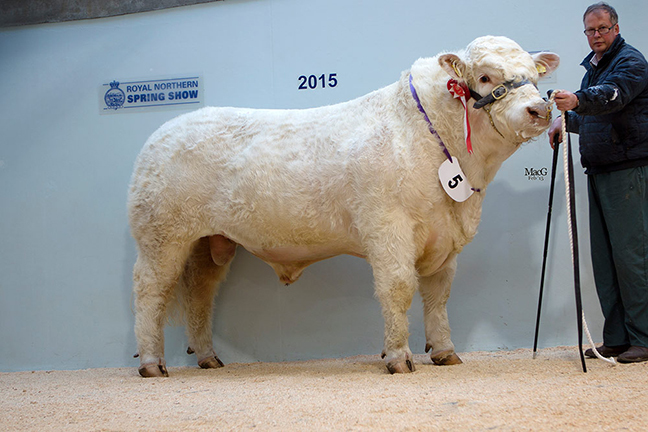 The 23 Month old Elgin Iggy TI +47 SRI +40 was next along at 6,800gns for Messrs RA Milne and son, Lhanbryde, Morayshire. This son of the 25,000gns Supreme Perth Champion Goldies Unbeatable went to C and V Fraser, Stronsay, Orkney. 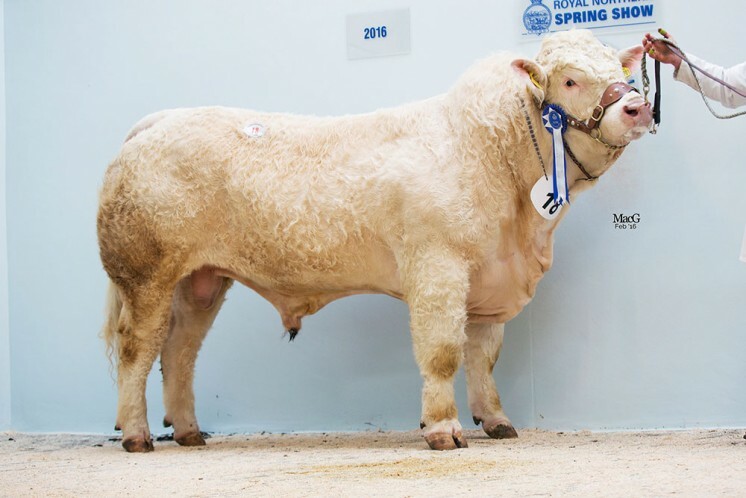 Michael Massie, Ellon, Aberdeenshire sold Elrick Independent TI +32 SRI +32, a 21 month old son of the 16,000gns Stirling Supreme Champion Thrunton Fearless who was purchased by GI and M Jamieson, Ellon, Aberdeenshire for 6,500gns, Another of Mr Massie’s bulls by the same sire, the 17 month old Elrick Illation TI +37 SRI +39 sold for 5,200gns to J and A Cooper, Laurencekirk, Kincardineshire. Next going to James A Younie, Elgin, Morayshire at 6,000gns was the 18 month old supreme champion Strathisla Icon TI +30 SRI +33 sired by Balthayock Aesop from Robert McAskie, Keith, Banffshire. Finally Graeme Leggat, New Pitsligo, Aberdeenshire raised 5,500gns for the 19 month old Kersknowe Clansman son Bonnykelly Impeccable TI +20 SRI +20, who went to JA Cruickshank, Elgin, Morayshire. 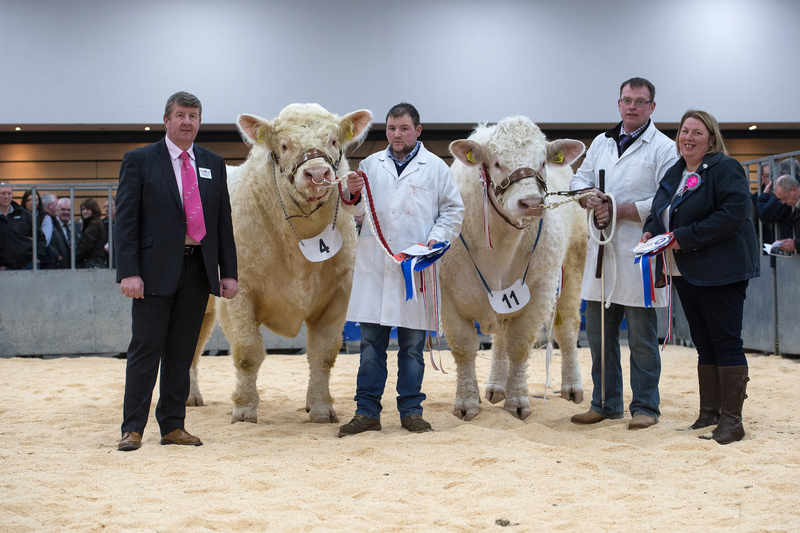 Charolais bulls led the trade at 6,900gns and achieved the day’s highest £5,043 average at the Royal Northern Spring Show, at Aberdeen and Northern Marts’ Thainstone Centre, Inverurie on Wednesday 26 February. The day’s top entry at 6,900gns was Kinclune Hayday, a 22 month old month old from John Wilson, Glenkindie, Alford. A Thrunton Crownprince son and out of a Caylers Solomon sired dam, he was knocked down sold to WLR Keir, Glenkindie, Alford. The 20 month old Kinclune Haemon, another Crownprince son from the same vendor made 5,900gns to G and K Gauld, Pitcaple, Inverurie. Elrick Hallmark TI +30, SRI +16, a 22 month old Maerdy Dublin son from Mike Massie, Auchnagatt, Ellon secured the reserve championship before making 6,000gns to Blackmoor Trading, Keith. Earlier in the day the same buyer invested 5,000gns in Elgin Highroller TI +52, SRI +45, a 25 month old by Elgin Davinci and out of a homebred dam by Harestone Safran from the Milne family, Llanbryde, Elgin. 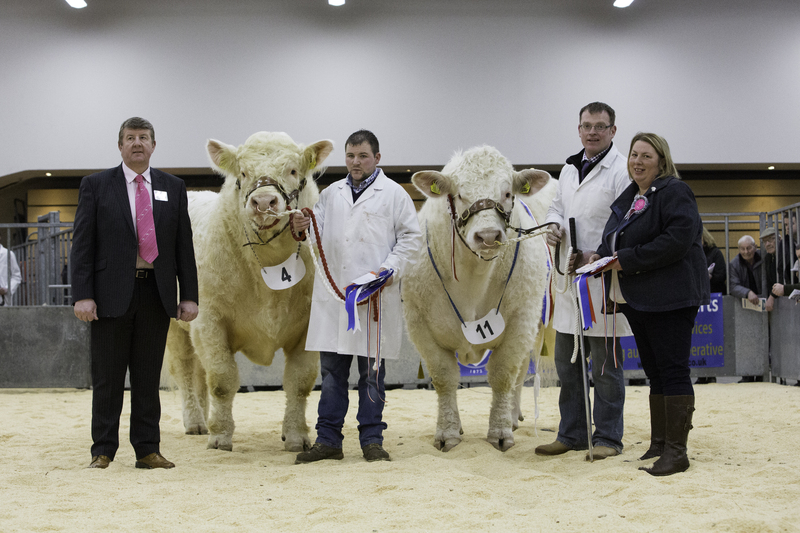 Charolais met an exceptional trade leading the Royal Northern Spring show, sale and averages at Thainstone Centre, Inverurie on Wednesday 27 February where bulls sold to a top of 11,500gns and 16 lots averaged £5,545.